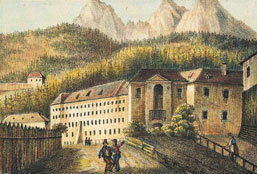 The history of Salzburg’s oldest brewery starts with the laying of the foundation stone by the Salzburg businessman Hans Elsenheimer. He made use of Kaltenhausen’s geological features. It owes its name to the cool air flowing out of the wind tunnels in the Barmstein rock formation. It was here, where the supply of pure spring water from the “Barmstein” was perfect for the production of beer and the cold underground chambers ideal for its storage, that he built the so-called “Kalte Bräuhaus”, the Kaltenhausen brewery, in 1475. 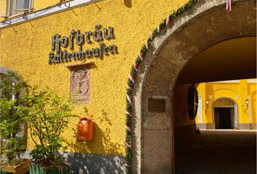 In 1498 ownership of the brewery was transferred to the Archbishops of Salzburg and it became the Hofbräu Kaltenhausen. Much has changed in the long history of Hofbräu Kaltenhausen but one constant has remained – maintaining tradition while simultaneously being open to new ideas. This creed was also the guiding principle at the opening of the speciality production centre and forum for beer culture in 2011.